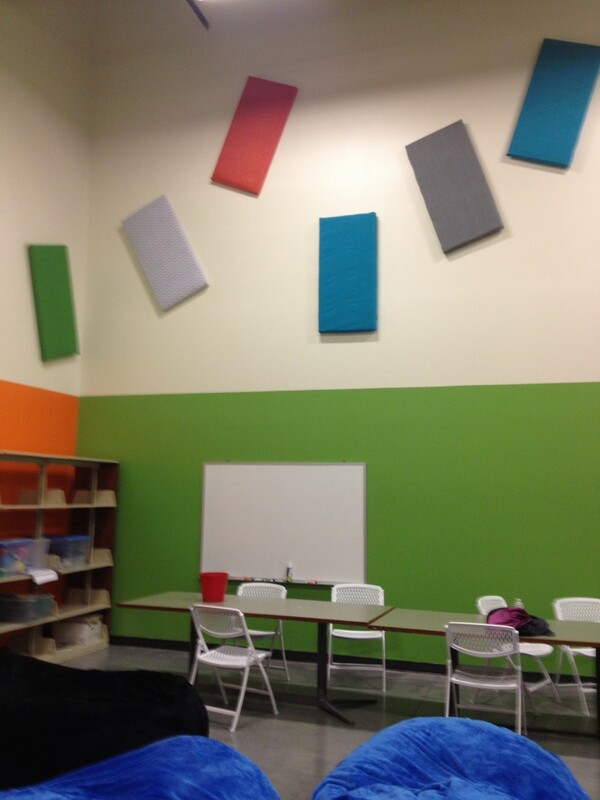 A quieter youth room is sporting new colors thanks to Kirstin Huget and many youth artists. 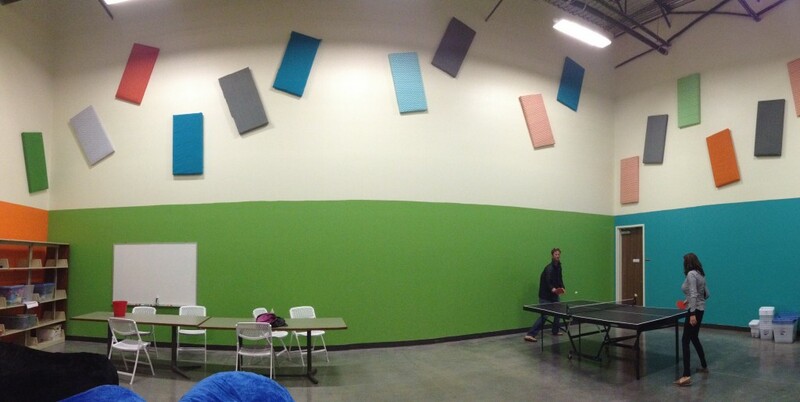 The pictures below show the walls, bean bag chairs and ping pong table surrounded by the colorful sound deadening acoustic tiles. 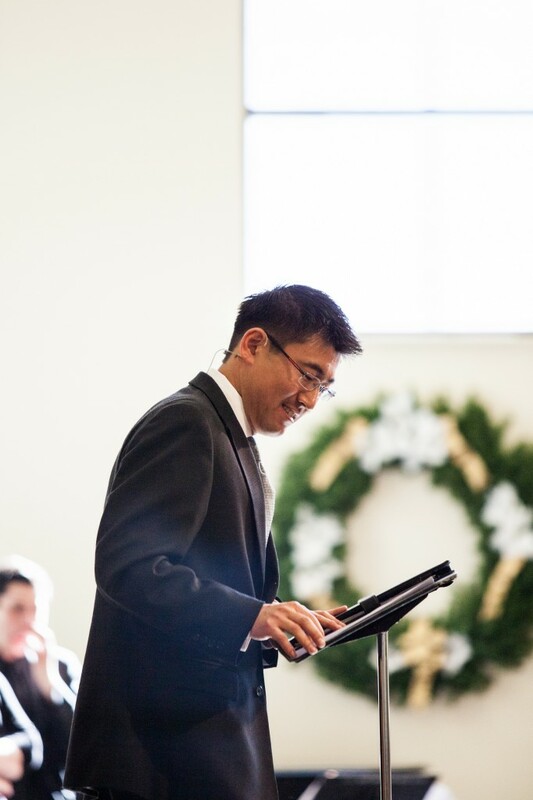 Editors Note: The pictures for this blog were taken in January, 2014 and the blog was written then. 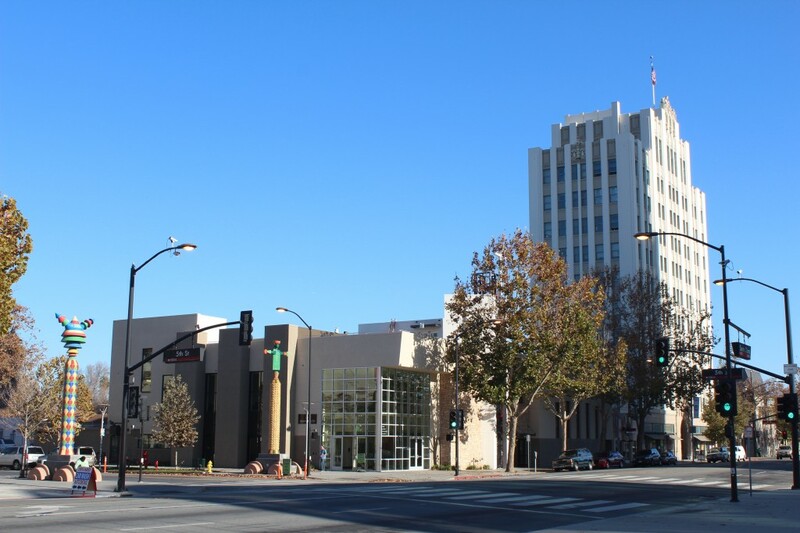 Sorry about a publishing glitch that resulting in its late release. 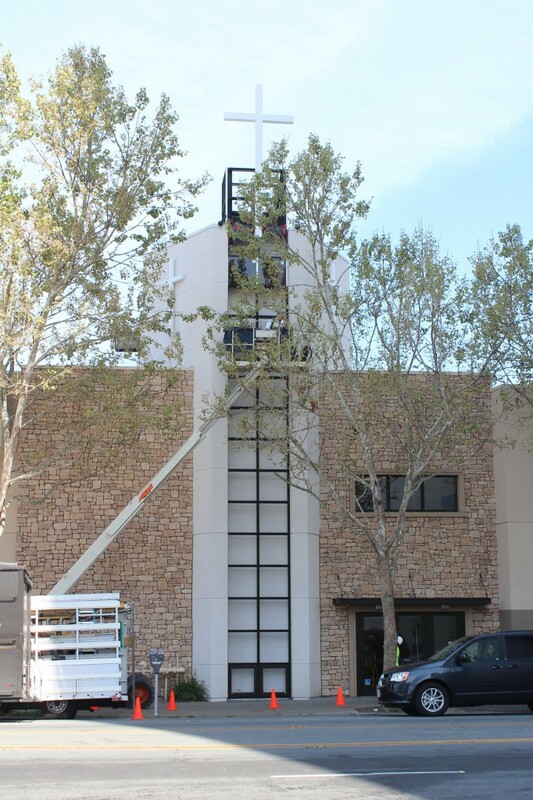 Eurobau delivered the glass panels on Friday, March 28th. 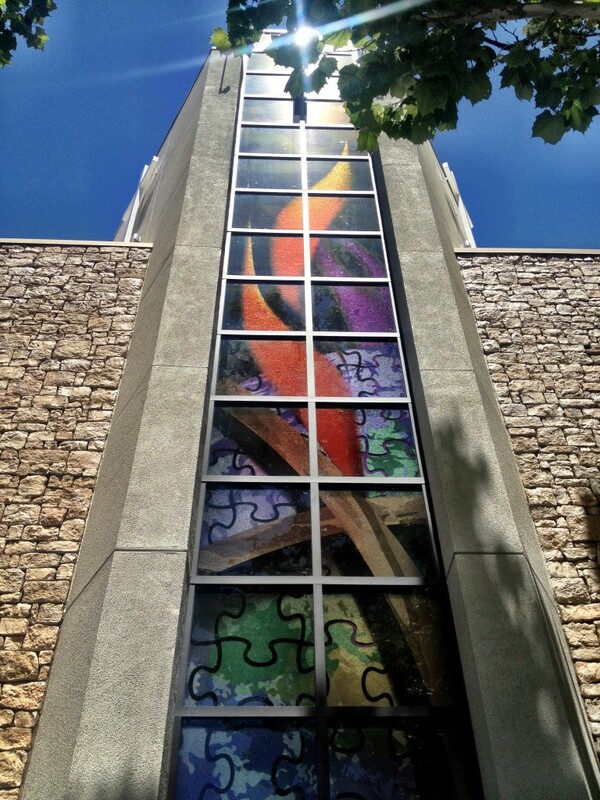 The pictures below show portions of the installation process and a few views of the finished art glass. 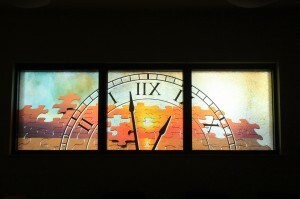 Future posts will provide more finished pictures of the art glass itself. 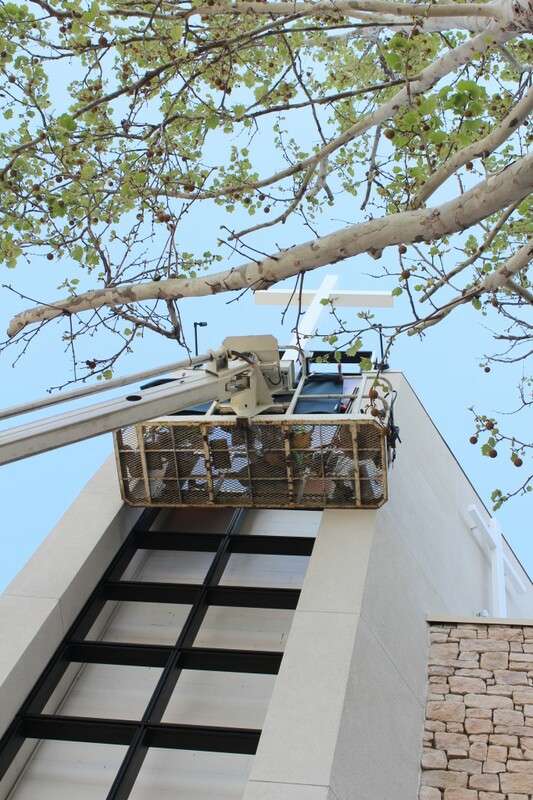 Installation of the new art glass for the tower, transom windows at the top of the stairs on second floor and in the sanctuary took place during the week of April 8. 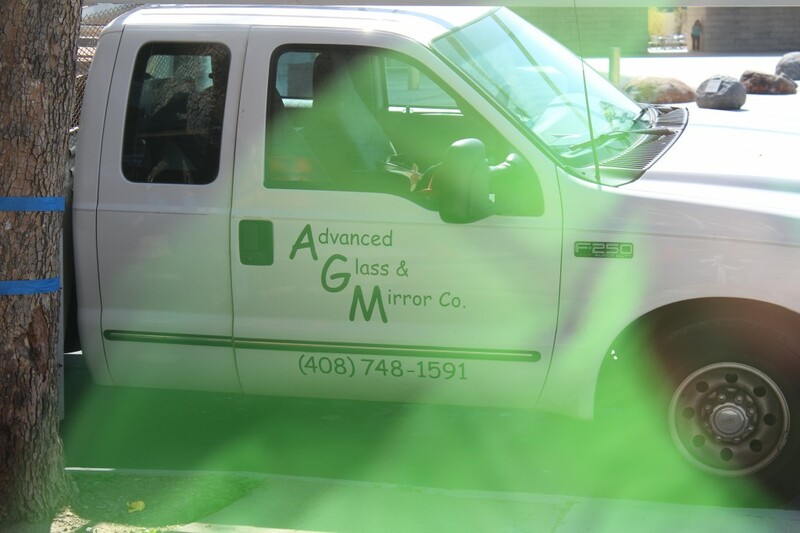 Here are a few pictures of the Advanced Glass and Mirror team during the install. 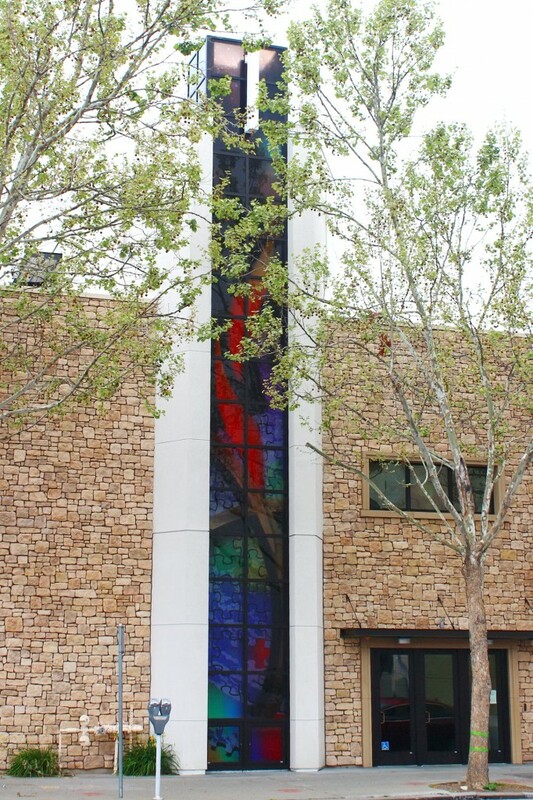 These pictures show the art glass in the sanctuary, tower and transom windows above the Narthex entry. The tower picture below courtesey of Pastor Shinya. 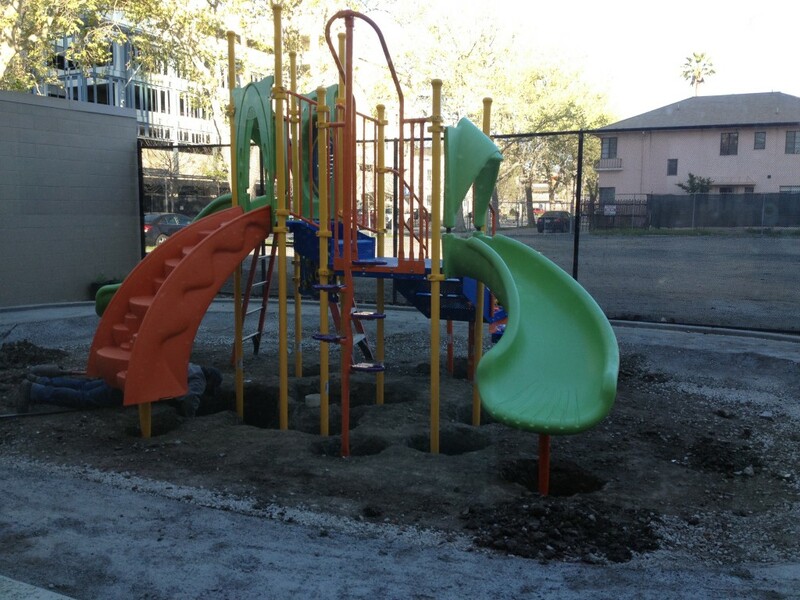 Work started on the playground early March and is now complete. 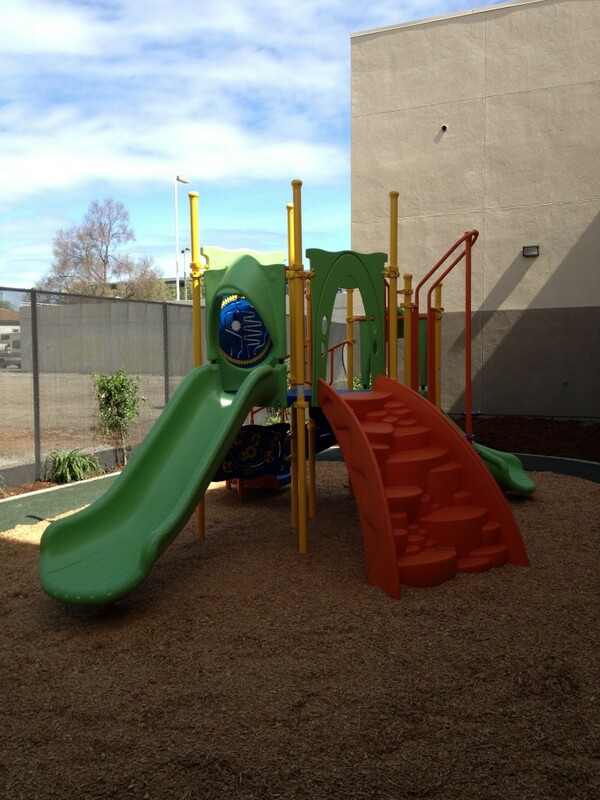 The play structure is designed to be compliant for educational codes and fun for the kids. 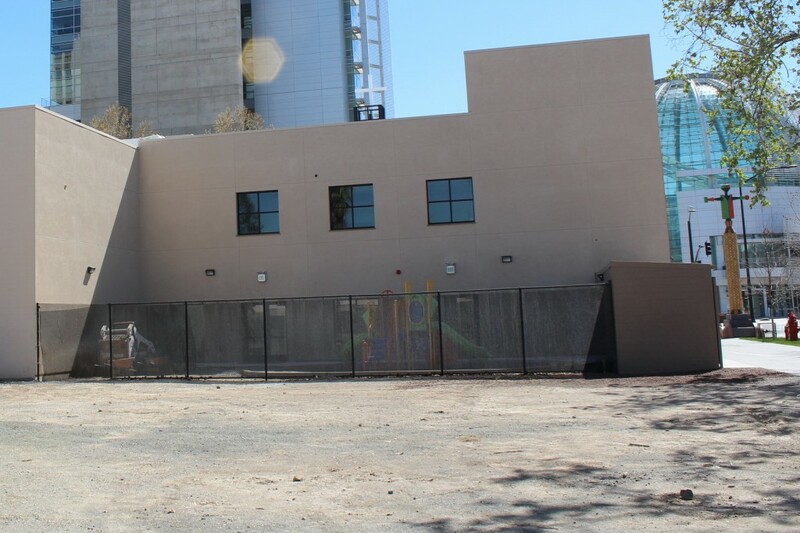 The fencing has been installed, and will be finished off with the completion of the playground. 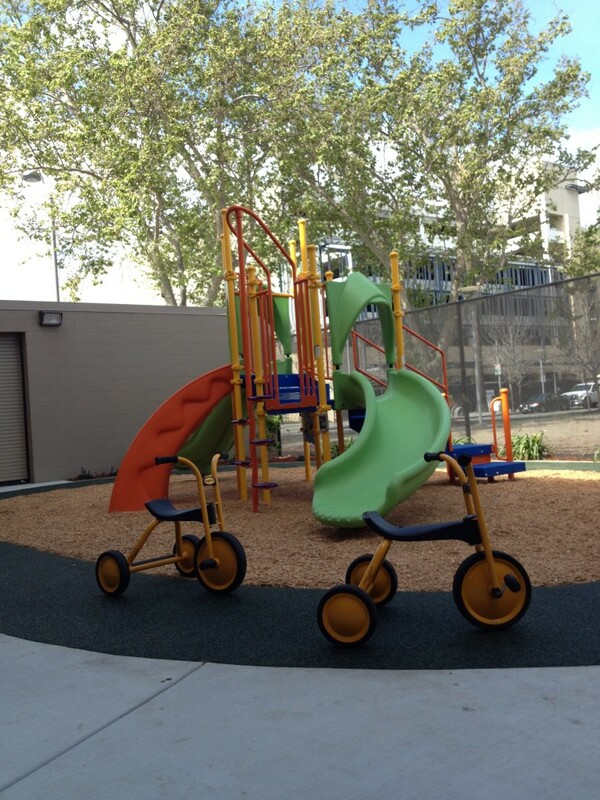 It’s very sturdy, and with each component embedded in its own concrete base. 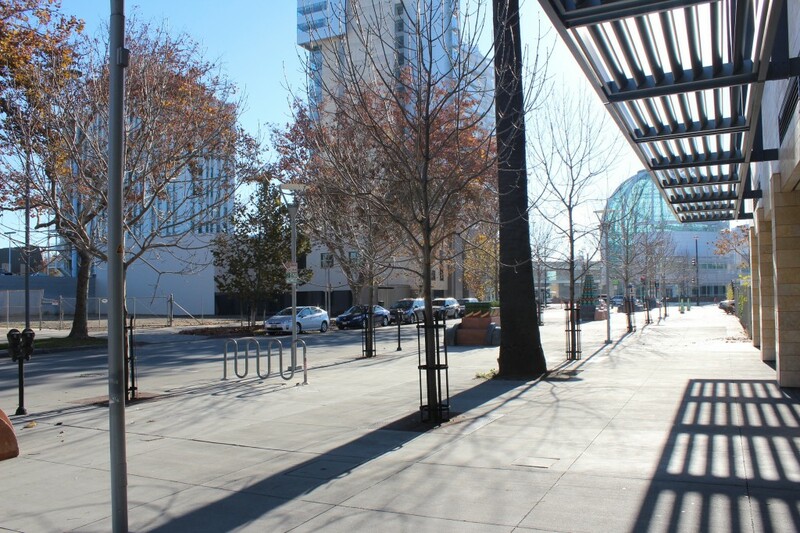 The oval track provides many options for walking, running and biking. 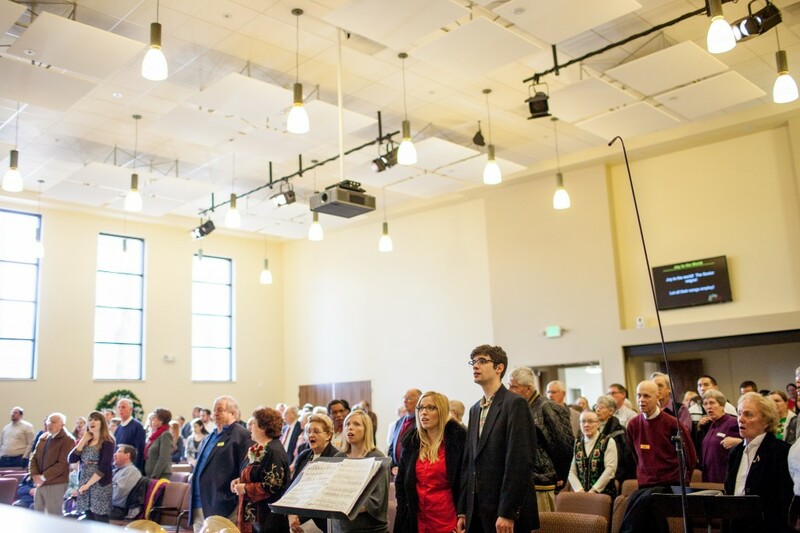 On Sunday, January 12th neighbors, friends, and four elected officials with long-standing personal connections to San Jose First Church joined our congregation to help celebrate our Community Grand Opening. 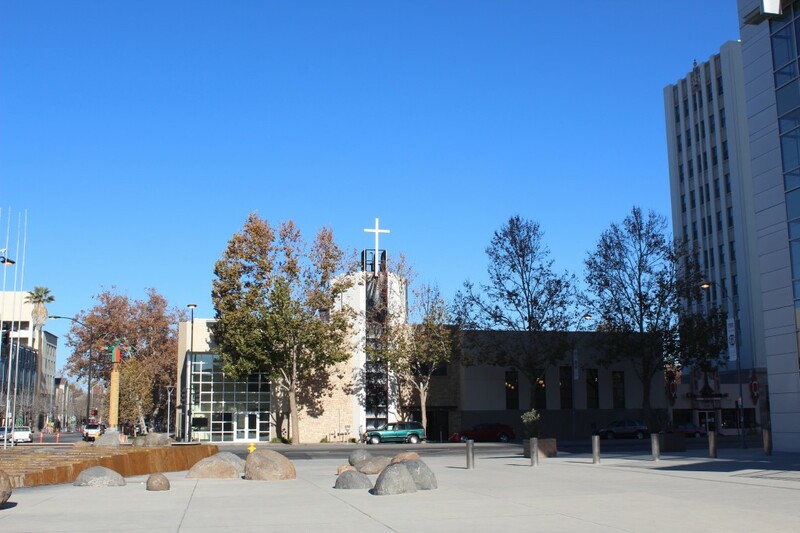 US Congresswoman Zoe Lofgren, representing California’s 19th District, provided a historical perspective of the strong connection between San Jose First Church and Horace Mann where her children attended elementary school. 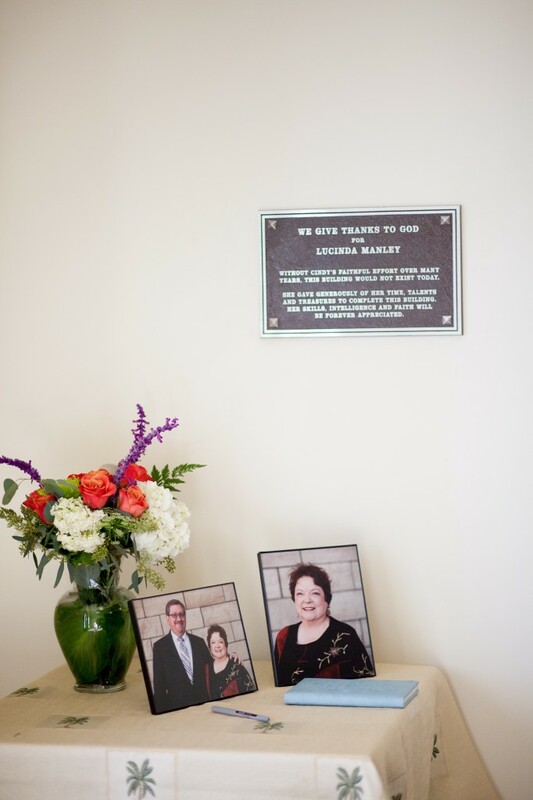 She reminded everyone of the continuing mutual support for each other through many phases of our respective building programs and the constant nurturing of the downtown community. 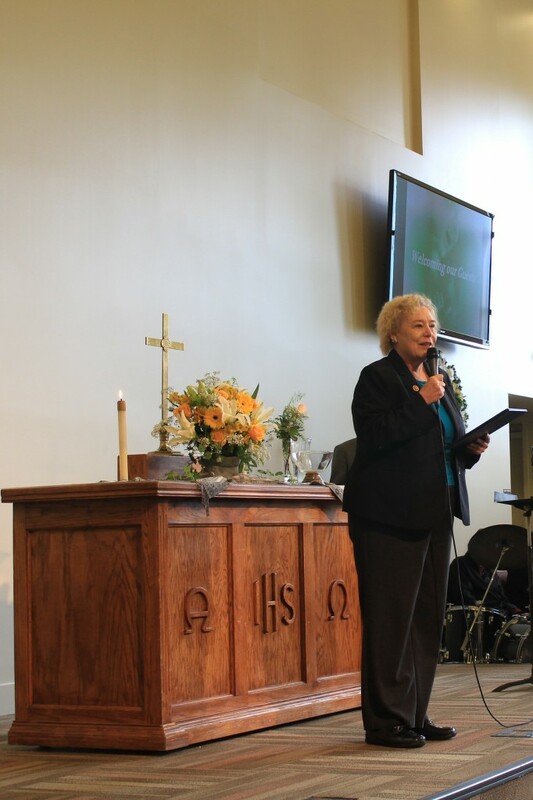 Congresswomen Lofgren presented the Church with a Congressional Proclamation (read it) honoring this special day. 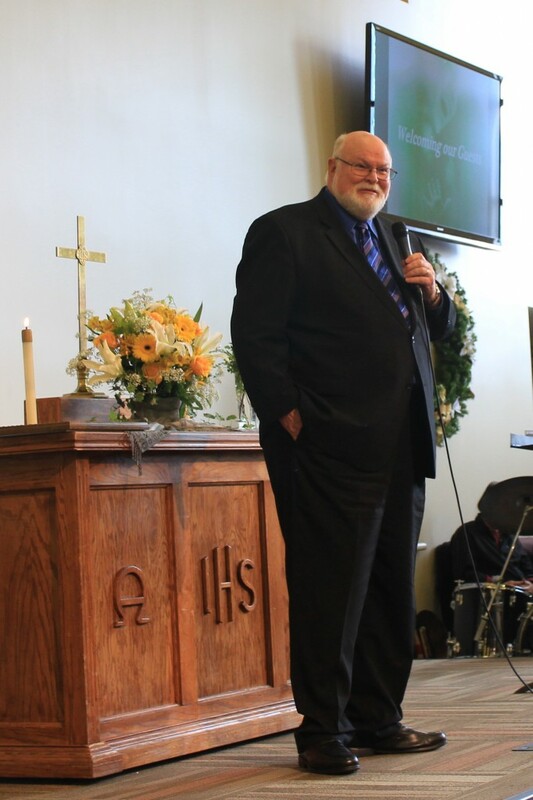 State Senator Jim Beall, representing the 15th Senate District, noted the long-standing history of our Church and the rebound following the fires in 1889 and 1991. 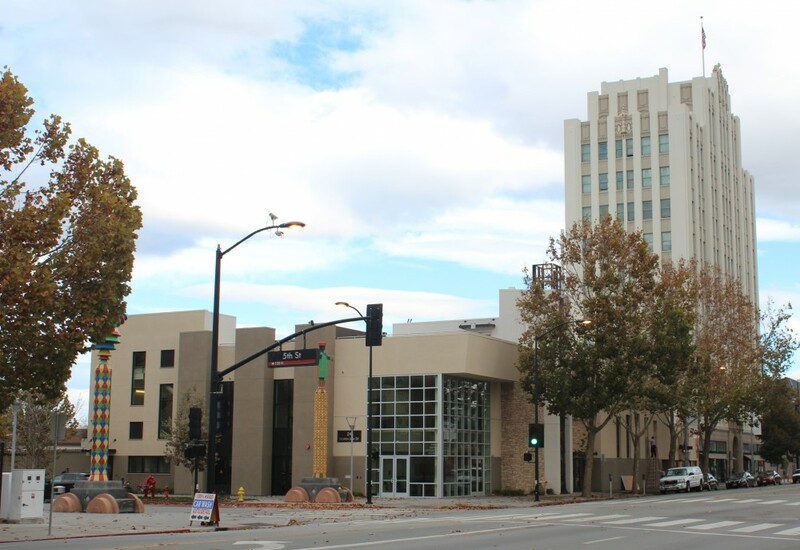 He pointed our that San Jose First United Methodist Church was the first Methodist Church in California. 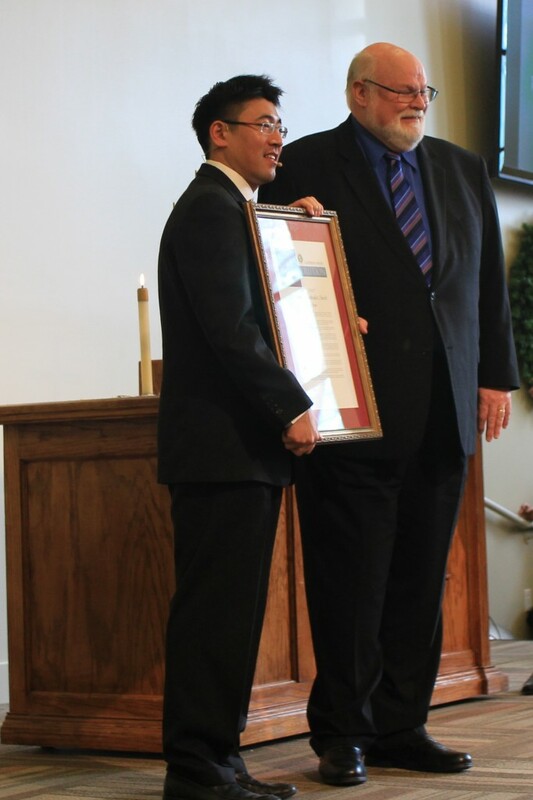 Senator Beall then presented Shinya and Jonathan with a proclamation (read it) linking the Church and community. 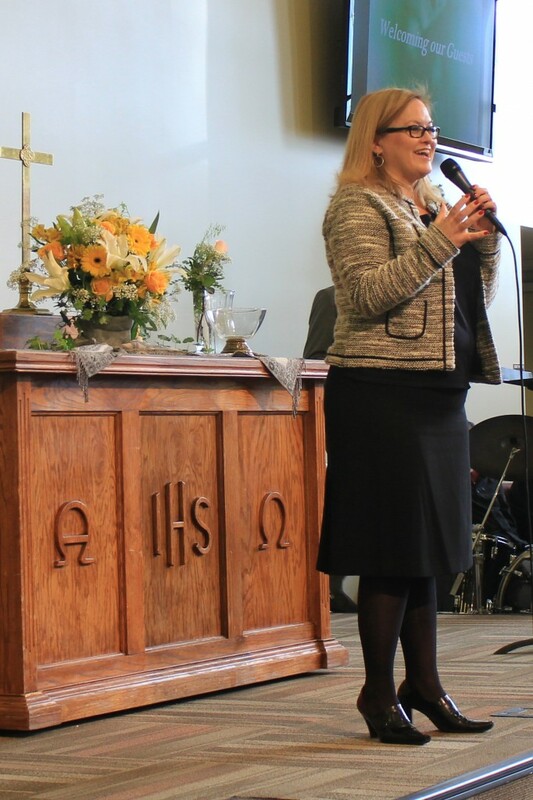 County Supervisor Cindy Chavez, representing the Second District, thanked the Church for their outstanding efforts to rebuild the Church while at the same time providing a platform for community development and social activism around the Church. 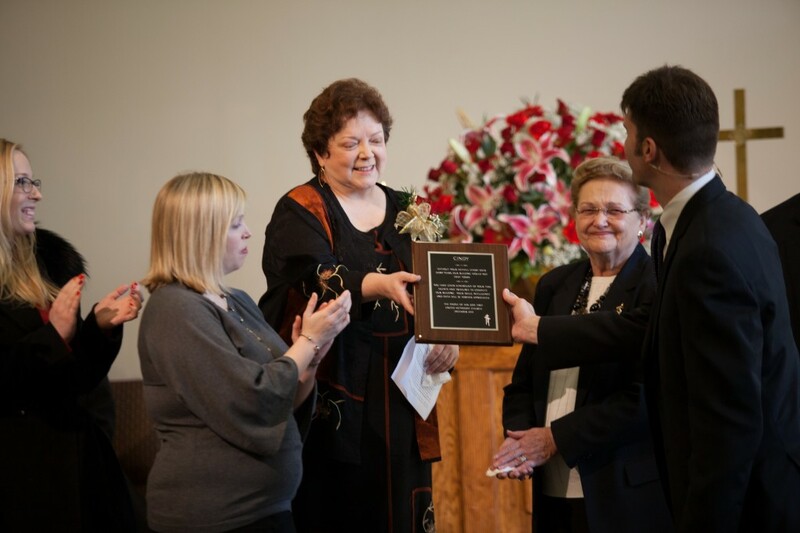 She singled out Cindy Manley our operations director and Jim Crawford our pastor for 22 years for their tenacity and faith in making today’s community grand opening possible. 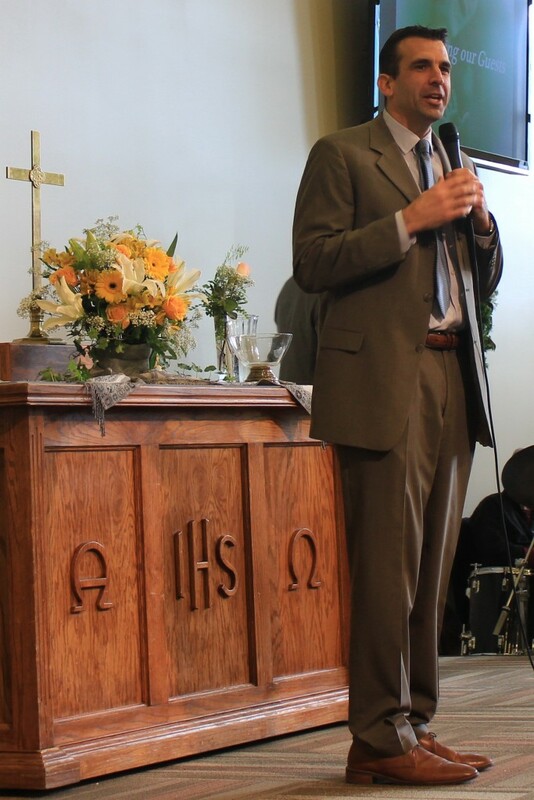 City Councilman Sam Liccardo, representing San Jose’s downtown District 2, congratulated our Church and congregation for never giving up and for providing new energy to the downtown neighborhood. 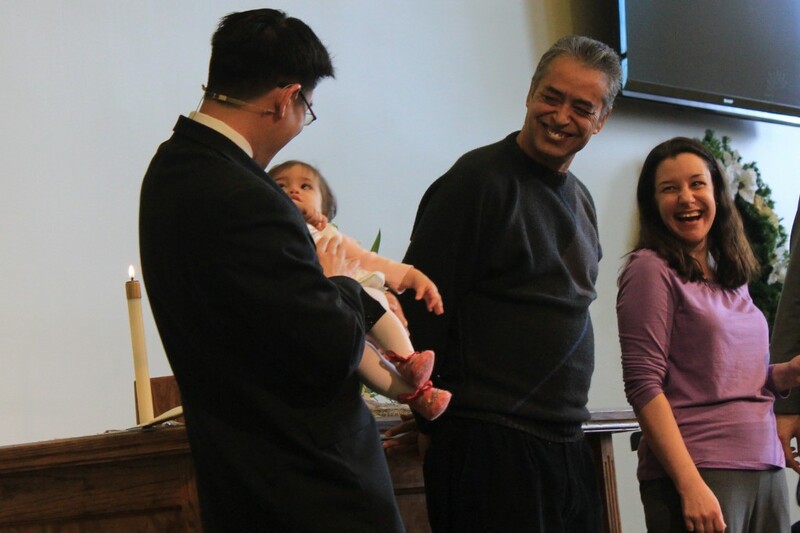 Following the presentations from our local officials Priya became the first baby baptized in the new Sanctuary. 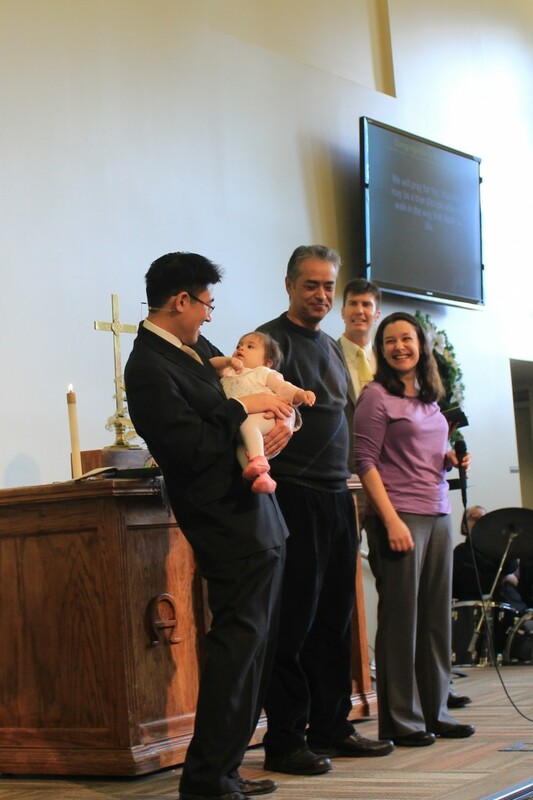 The ceremony was especially significant and happy for Pastor Jonathan as this was the first baby he’s baptized. 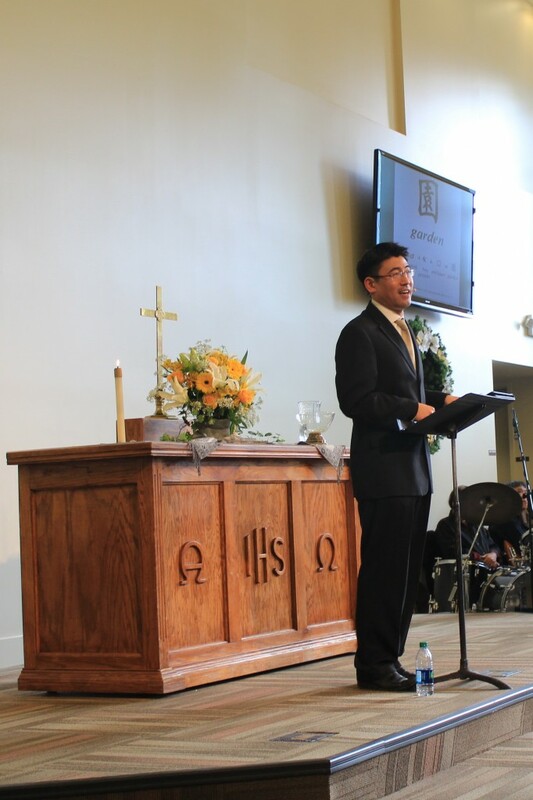 Pastor Shinya’s sermon – the second in a series on the book of Genesis – was thought provoking, meaningful and delivered a powerful message on languages and culture spanning thousands of years . 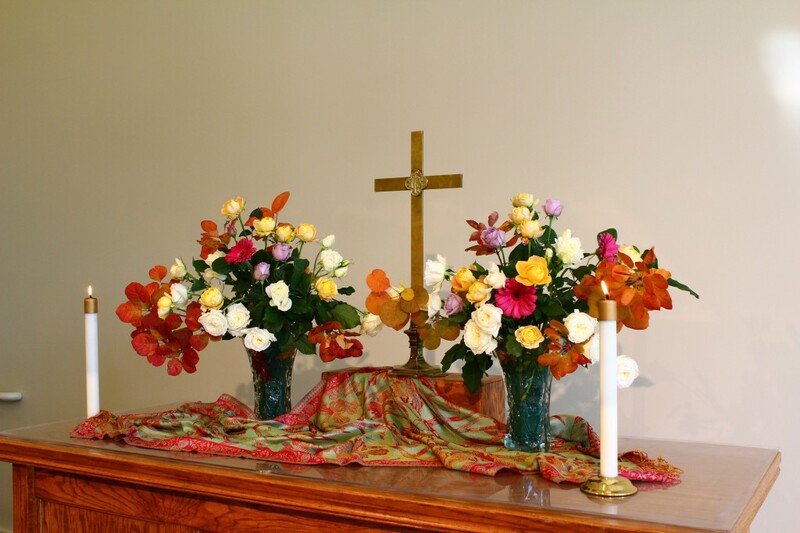 . . Special music for the day included “And on This Rock” by the First Church Singers and “Song of Gladness” by juBELLation. 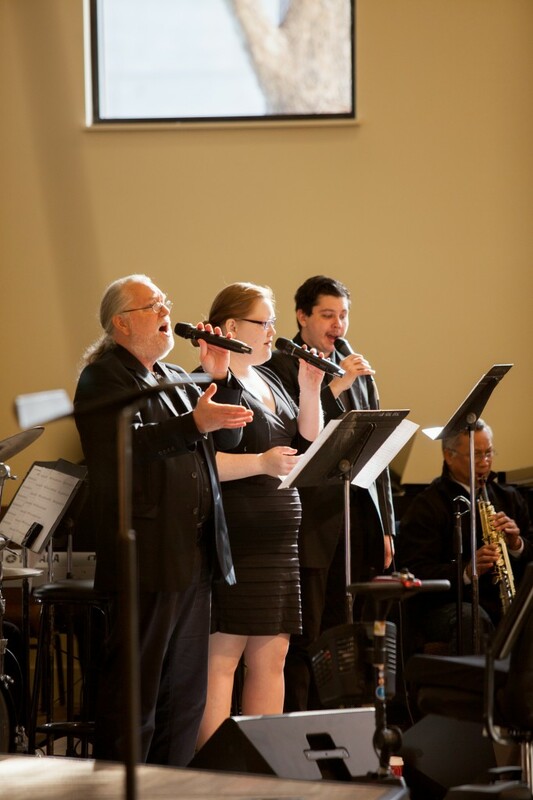 If you are interested in joining either our vocal choir or handbell choir please contact the office and they will put you in touch with the appropriate director. Our kitchen layout has changed since initial design. For example we switched from built-in coffee and tea makers to more portable versions. To better accomodate this change Degryse electric modified two circuits from 208 VAC to 110 VAC. 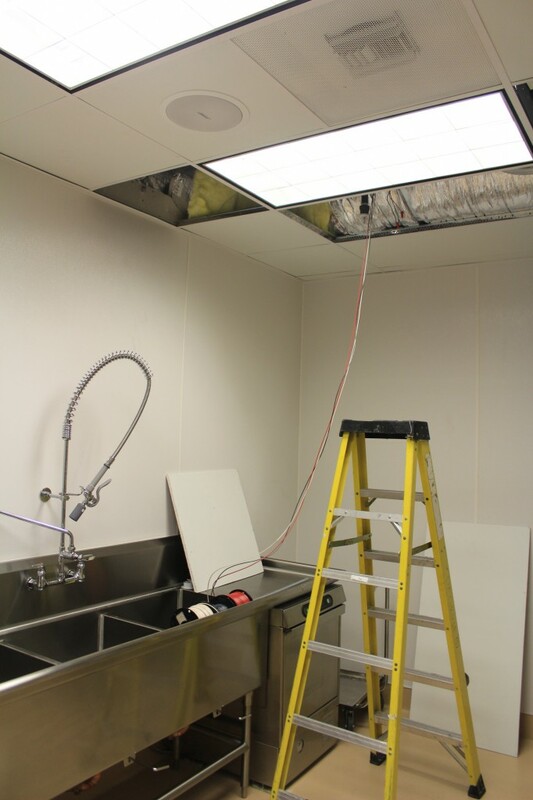 They also separated one of our counter-top circuits into three separate circuits by adding two more. 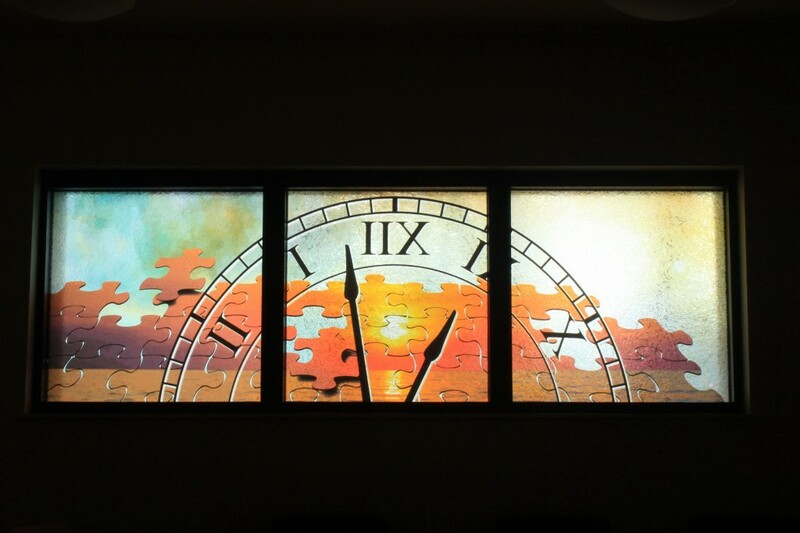 While you might imagine ripped up wall board and hours of adding new wire, this change was rather minor. 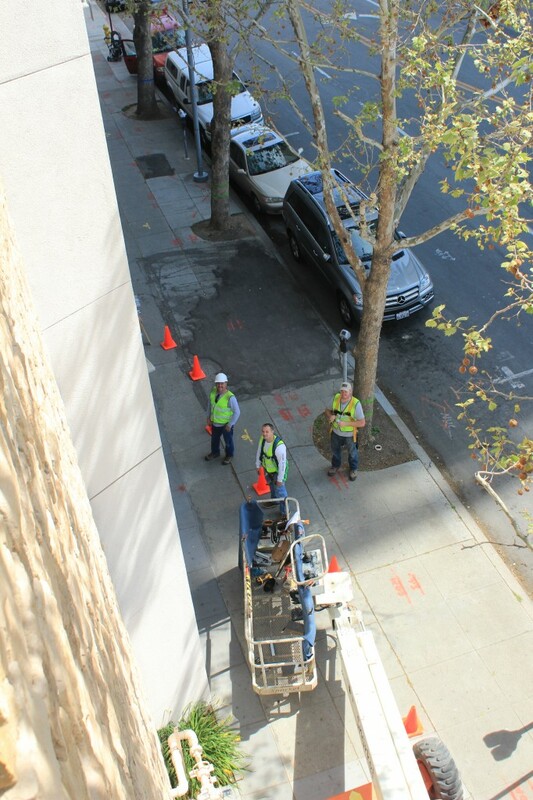 We’re fortunate to have their experience behind us during this project. 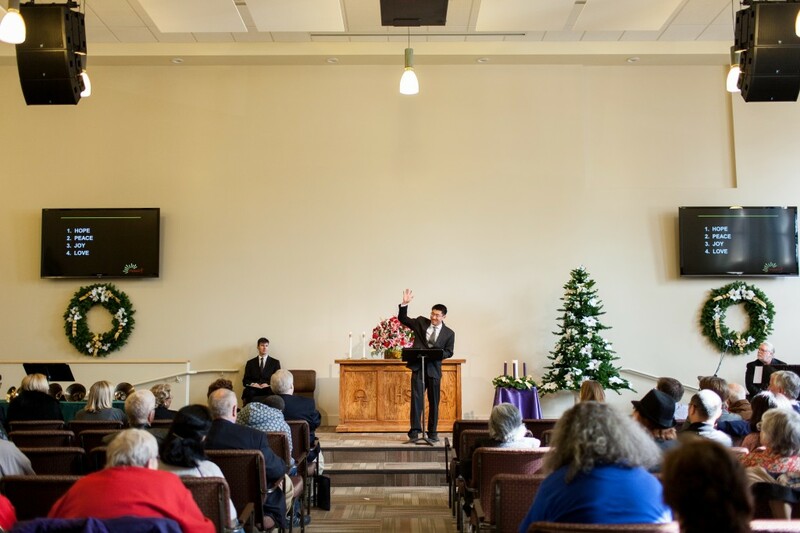 Turns out many circuits, in the kitchen and other locations of the Church, are accomplished by multiple runs to J-boxes in the ceiling. These J-boxes are then connected to the switch panel with separate runs. 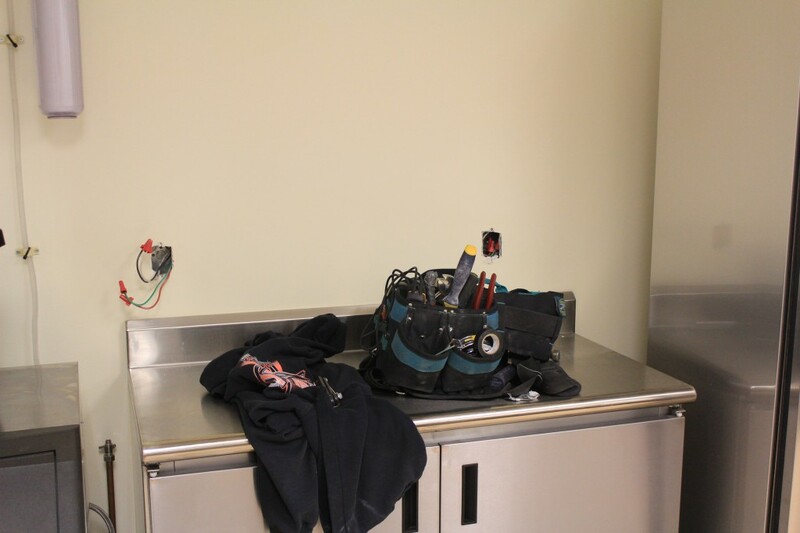 To accomplish the addition of two new circuits in the kitchen, their electrician was able to make two short runs from the electrical room to the kitchen ceiling, then modify the wiring in the J-boxes. Much simpler than massive re-wiring you might expect to affect such a change. 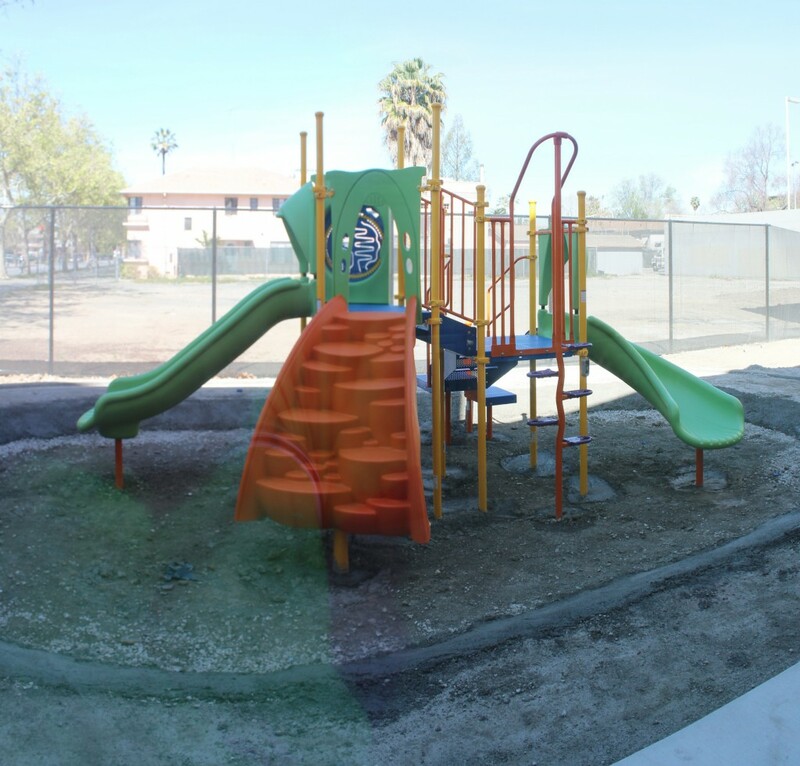 These two pictures show the addition of two new runs from electrical room to kitchen. Below are the two coffee circuits which have been changed to 110 VAC. 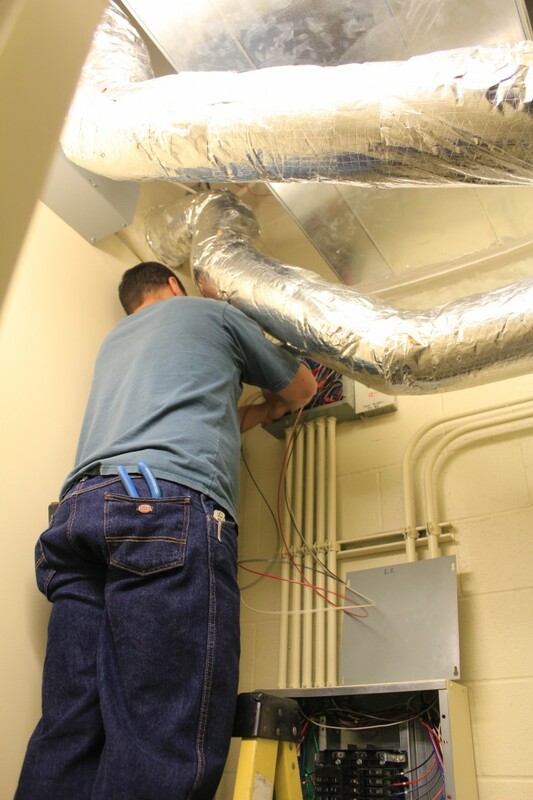 If in the future we install built-ins, the switch back to 208 VAC will be simple; no re-wiring required. 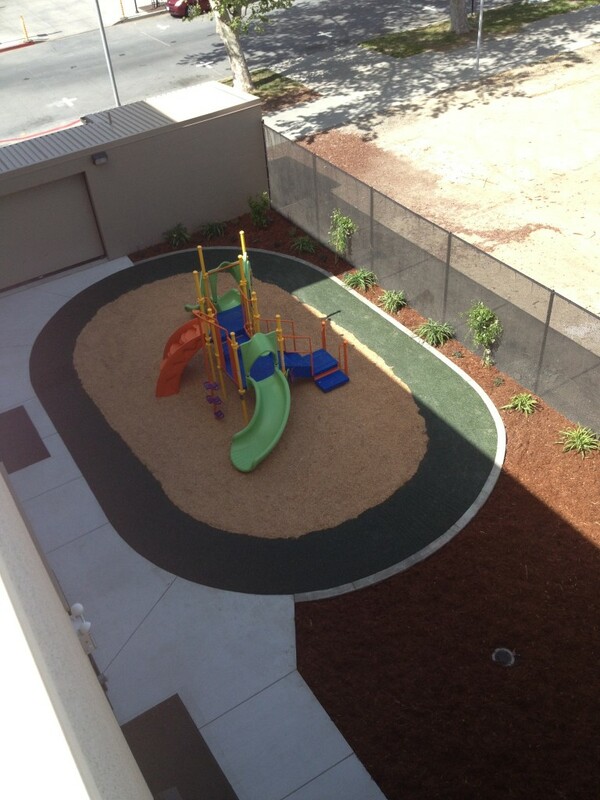 These pictures of our grand opening were provided by Micaela Go. 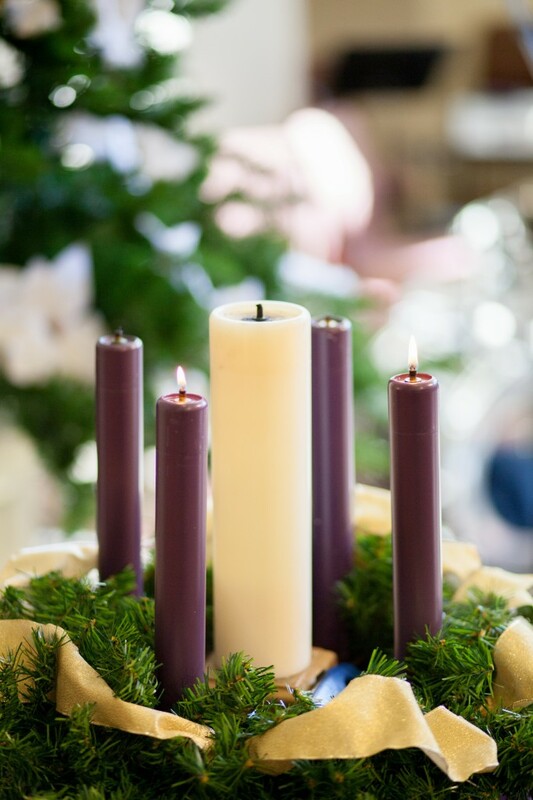 You can see additional samples of her creative work with weddings, families and children here: www.faustphotographics.com. 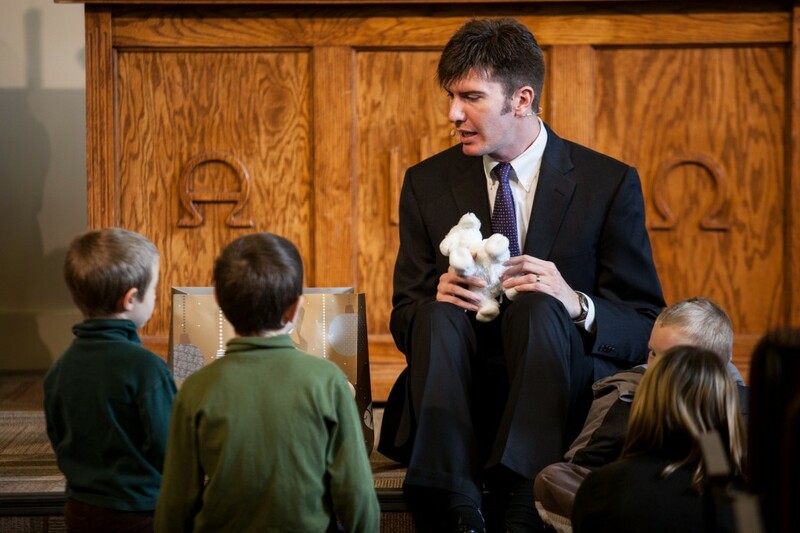 Thank you, Micaea, for these wonderful pictures. 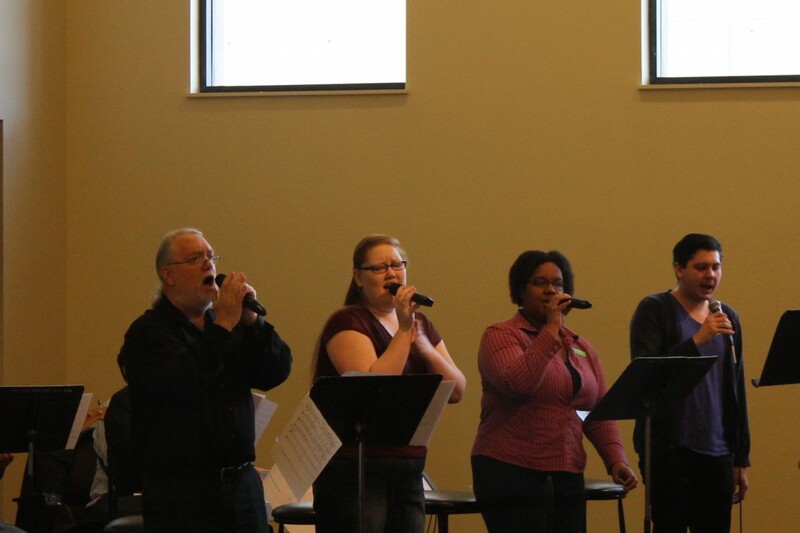 Our Grand Opening on Sunday, December 8th was well received with 160 in attendance. 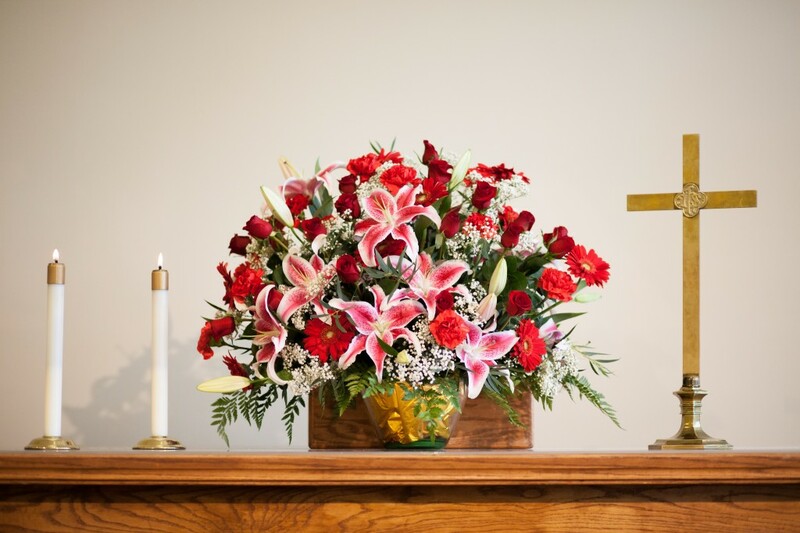 Joan Clemments created a special flower arrangement in honor of the day and as a gift from Cindy’s mother. 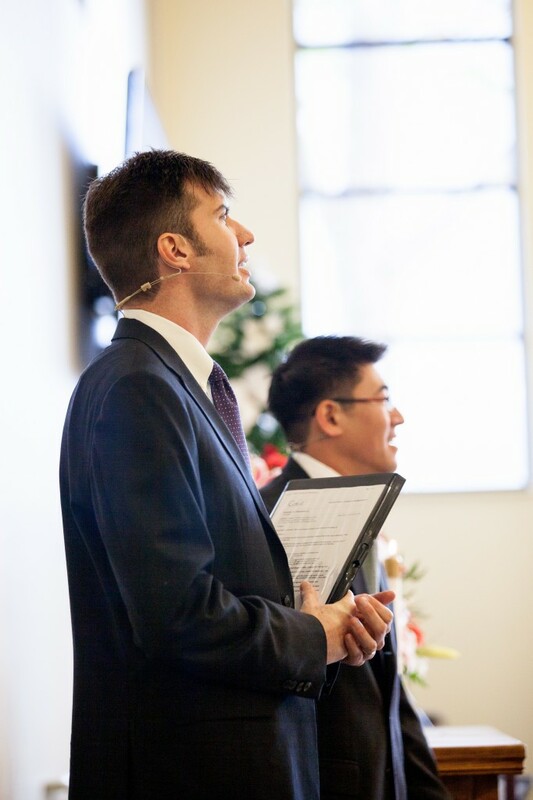 Pastors Jonathan Taman and Shinya Goto officiated. 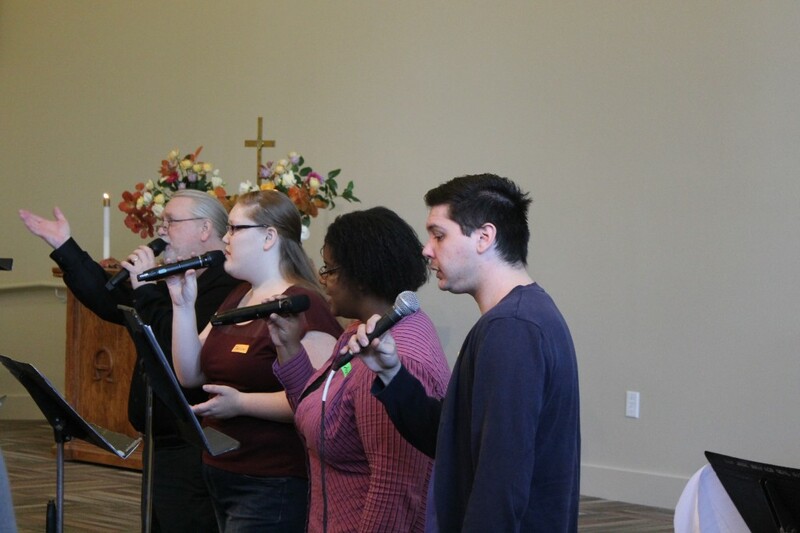 Joey Niehuis and his team provided worship leadership and uplifting music. 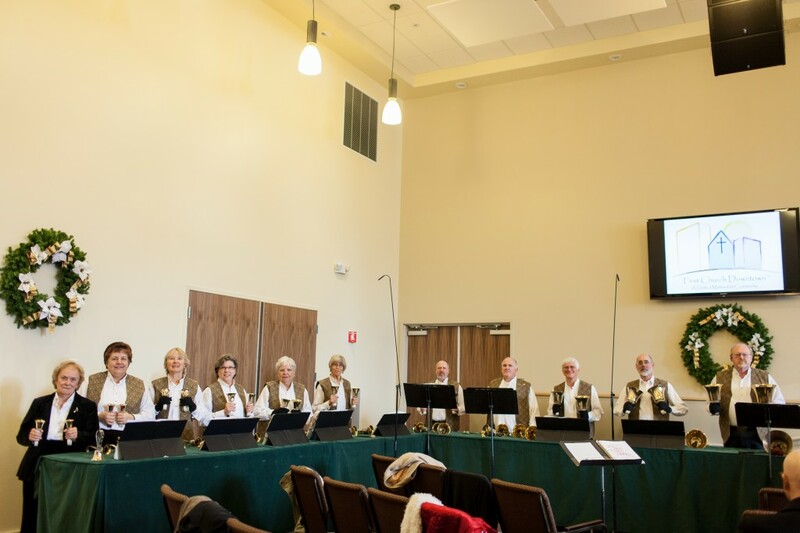 The JuBELLation handbell choir directed by Darlene Woodburn offered songs of gladness for this special occasion. 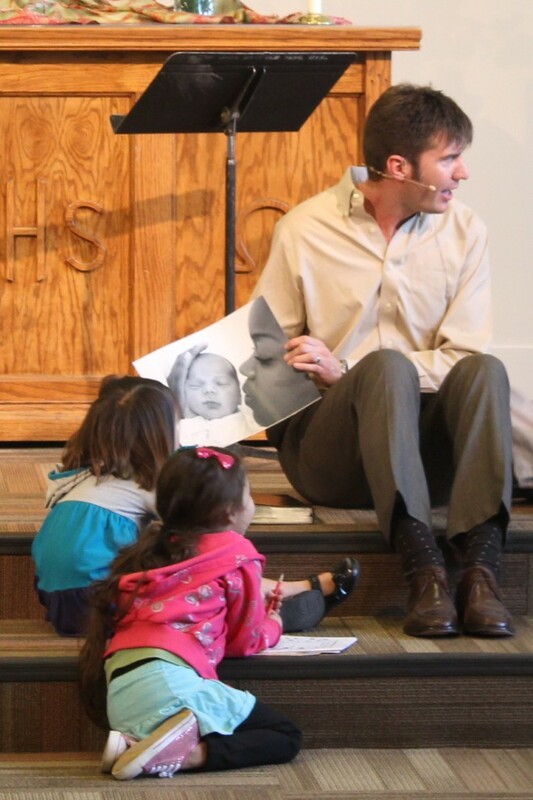 Pastor Jonathan lead a children’s moment and talked of Peace. 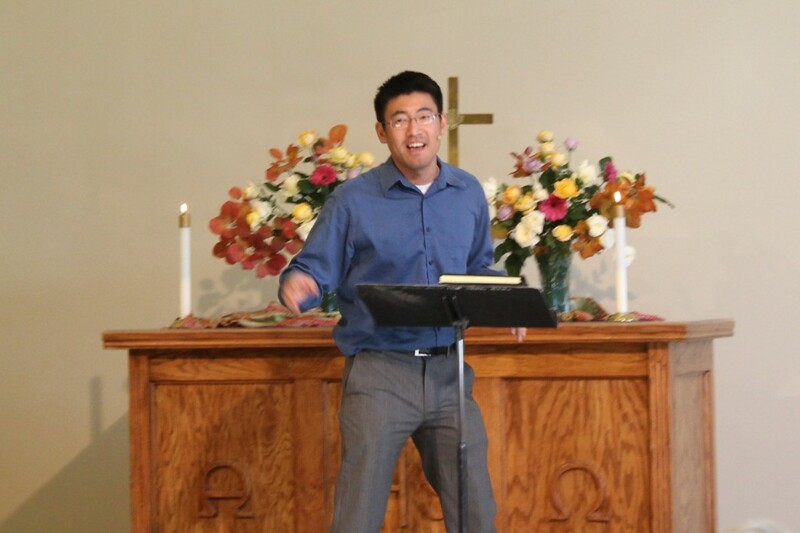 Pastor Shinya continued our advent celebration. 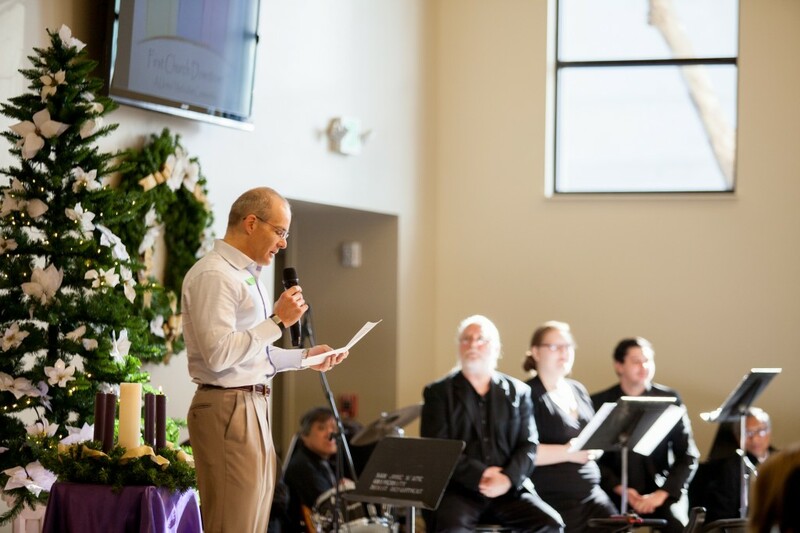 Jeff Hugot provided a brief history of our Church and thanked our builder Southbay Construction, architect Vitae Associates and owners representative Dan Shore for making our Church a reality. 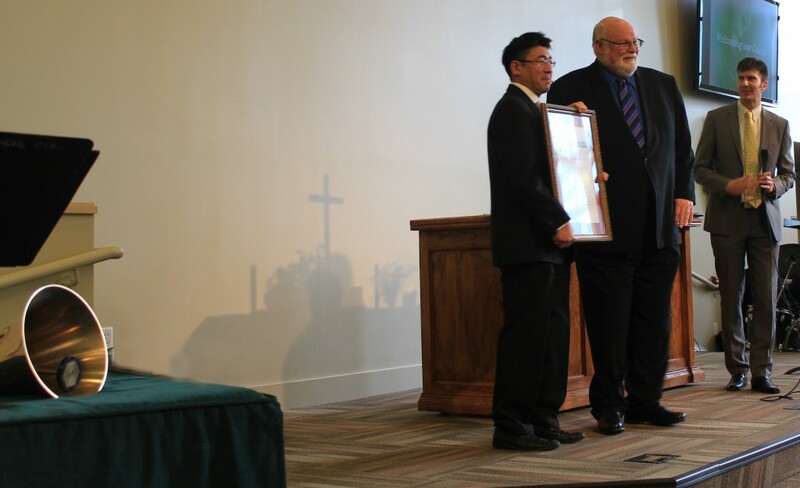 Pastor Shinya reiterated our thanks and admiration for the dedication tireless work of Jim Crawford and Cindy Manley. 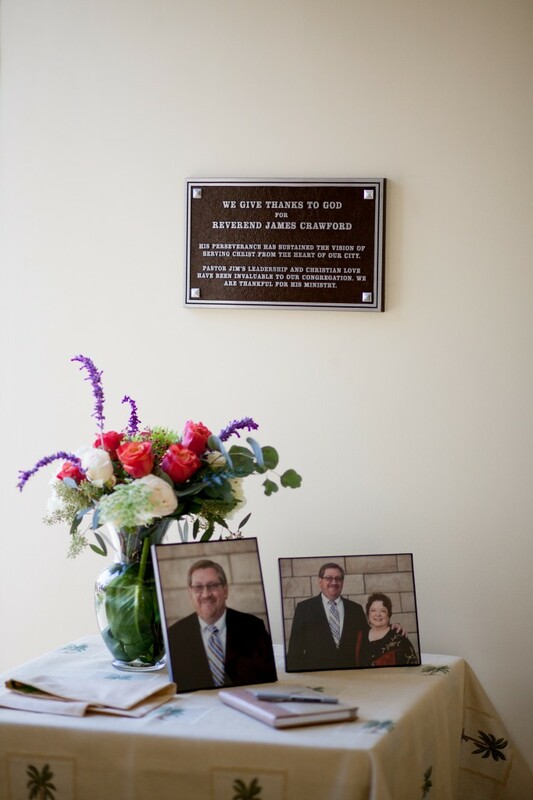 Pastor Jonathan presented plaques to Cindy and Jim A permanent plaque honoring Cindy’s work is located in the atrium. 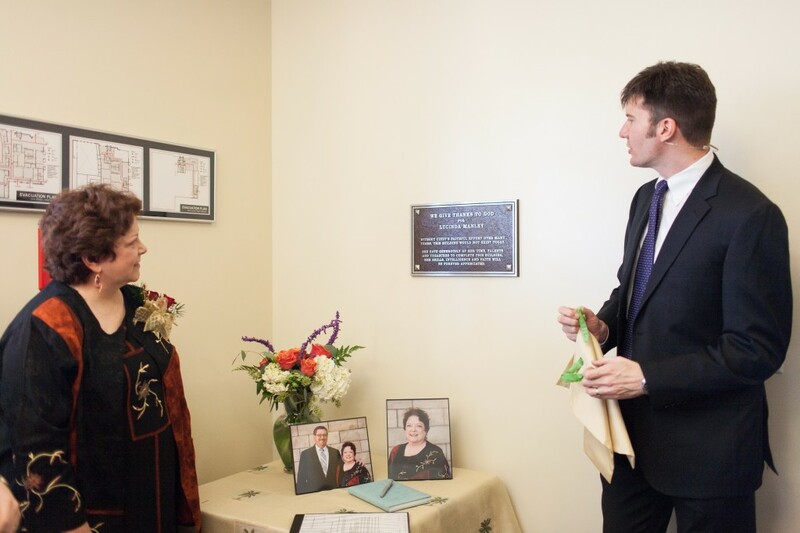 Jim’s permanent plaque is located in the Community Service room visible from inside and outside the building. 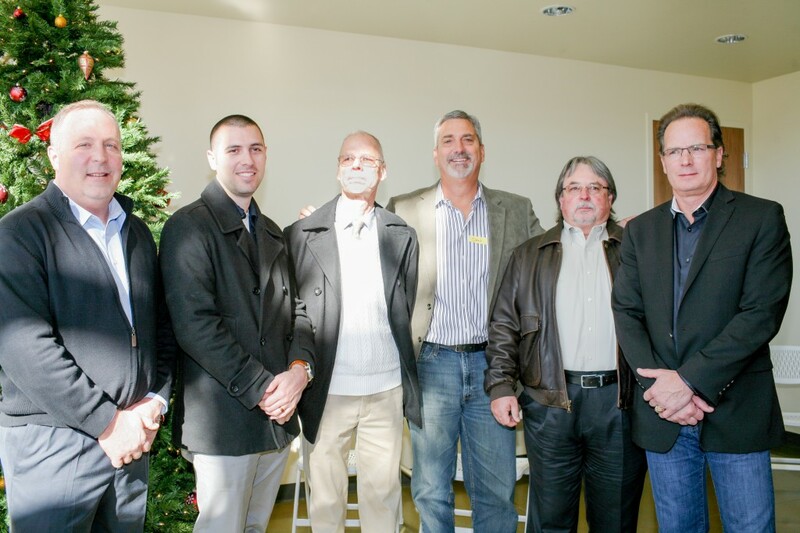 The team who brought our Church to life: Marc Anderson-program manager, Anthony Cirinelli-project engineer, and Larry Smedley-project supervisor from South Bay Construction; Dan Shore our owners representative from Shore Associates; Paul Hocket, president of Vitae Associates, our architect; Rich Furtado CEO of Southbay Construction. 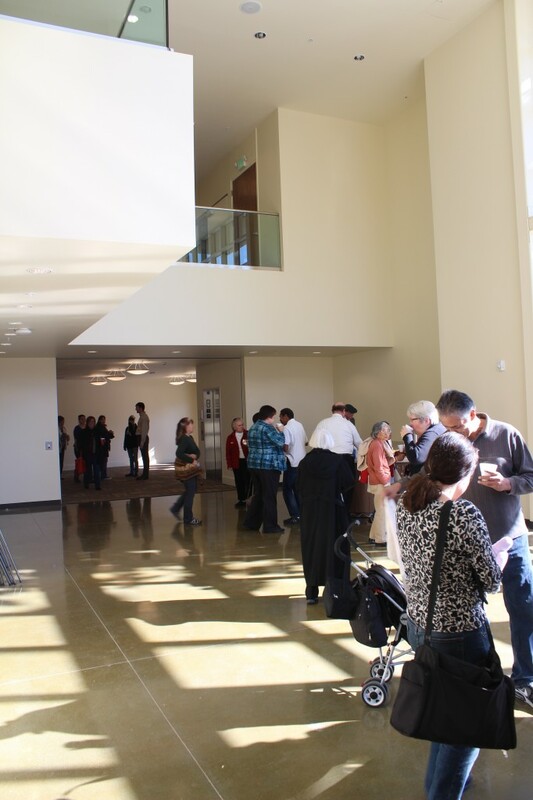 Yesterday’s Grand Opening was a huge success, with pictures to follow shortly. 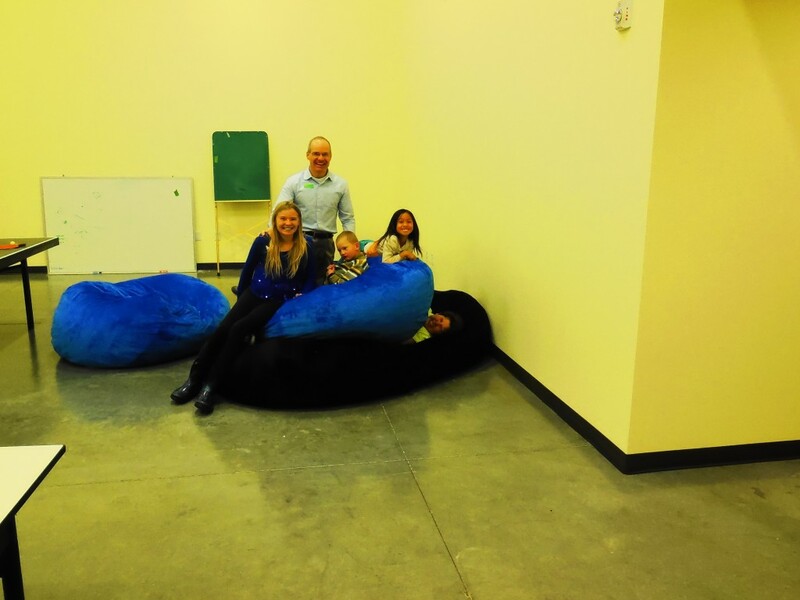 After service Jeff, Noelle, Nathan, Alyria and Gabe enjoyed burning off energy in the new Youth Room. 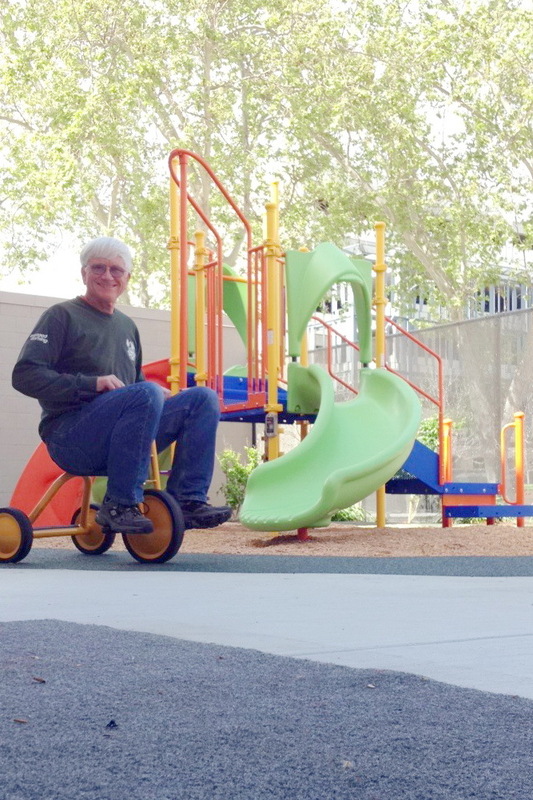 Earlier in the week an un-named outside pre-school toy tester verified all was well with the new Trike Force in anticipation of the Grand Opening event. 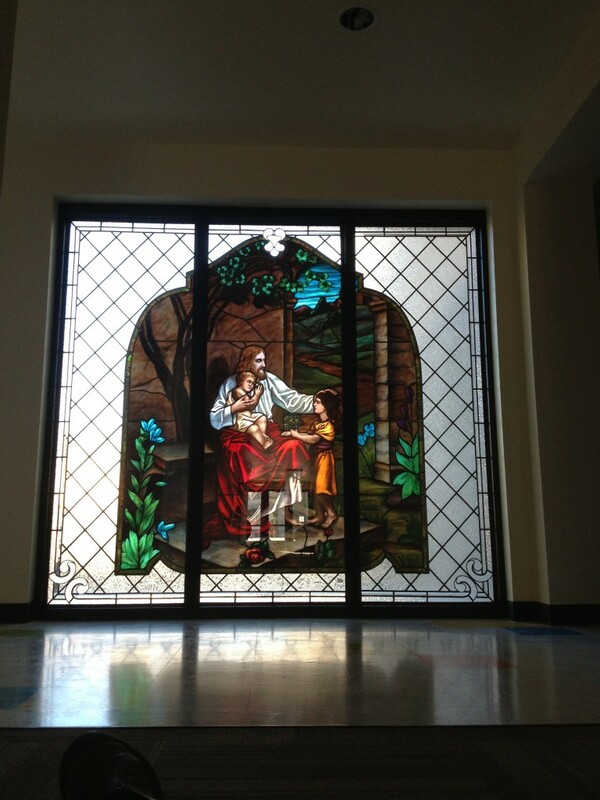 Last night Eurobau installed the “Jesus and the Children” window. 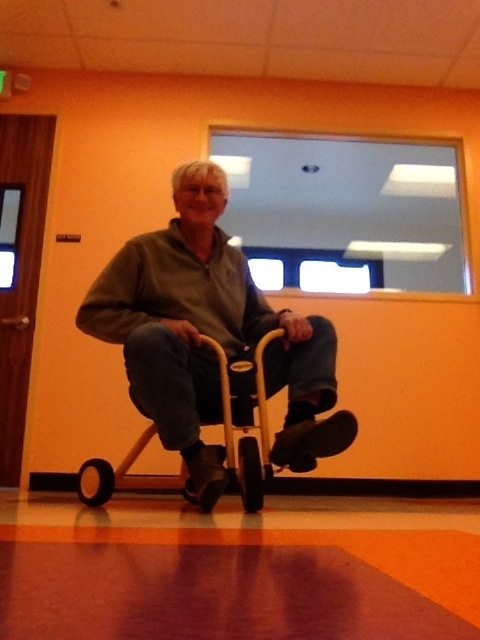 The landing at the top of the stairs on the second floor has many uses. 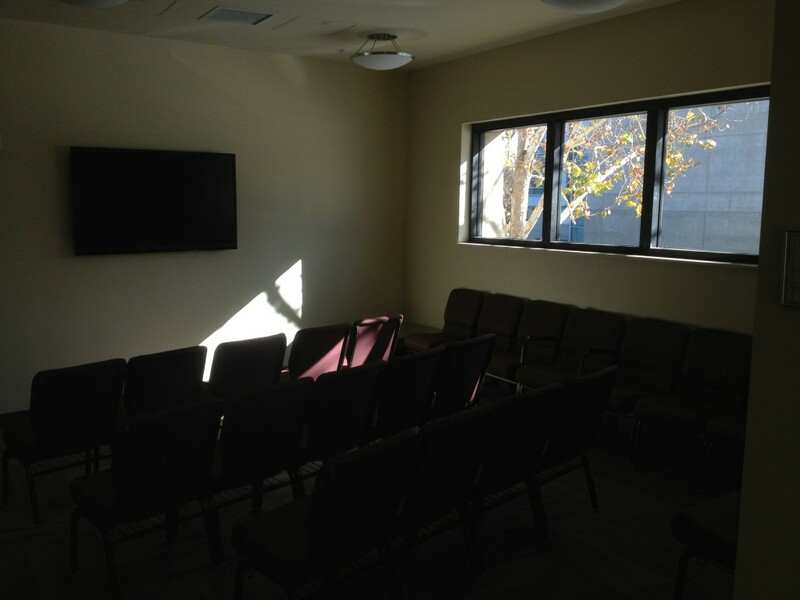 When configured with rows or chairs it can be used for viewing worship services by families including nursing mothers. 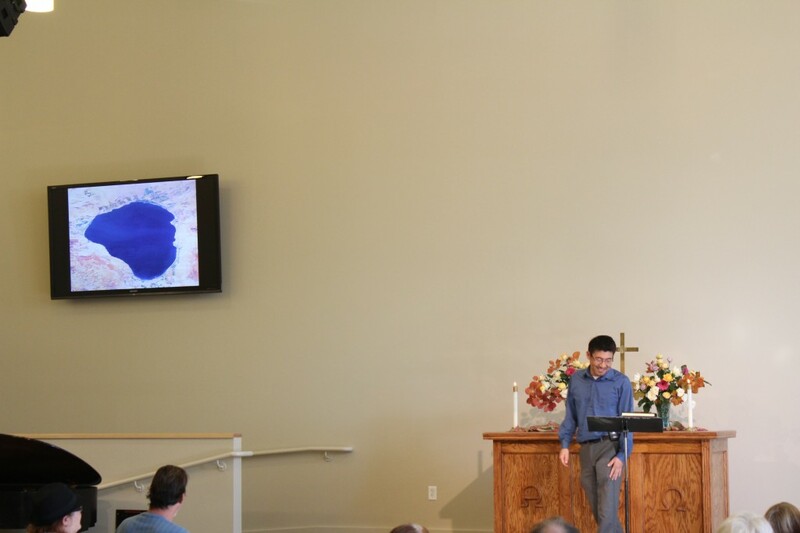 The display shows a view of the service plus an inset of the slides be presented with hyms, readings or pictures. 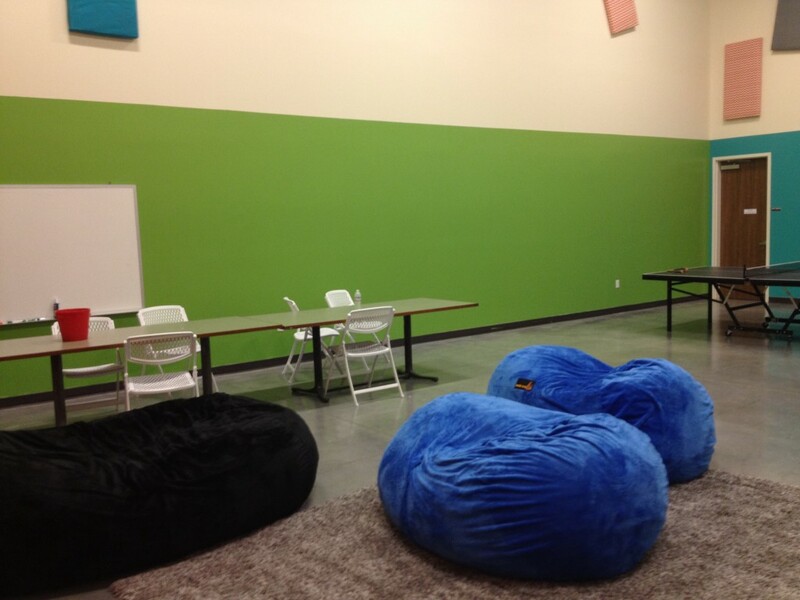 It also provides a meeting space for small groups when set up with a few chairs and central table. 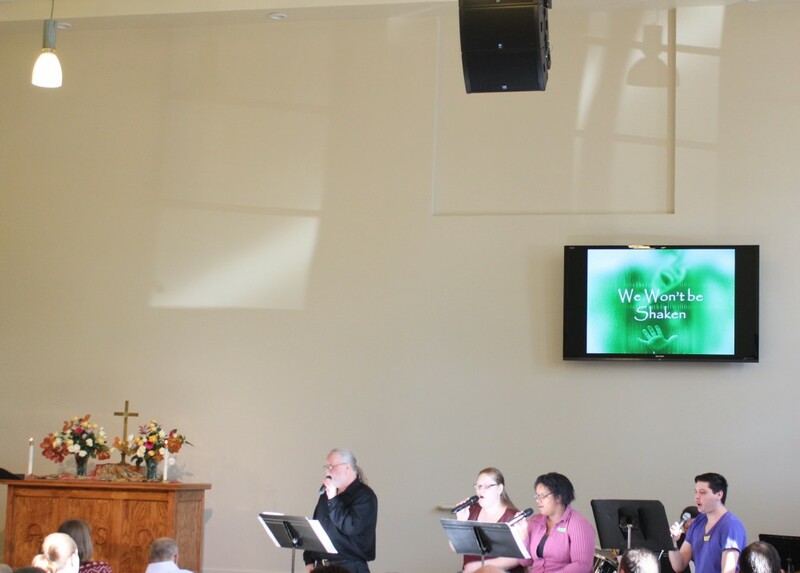 Today we held the first service in our new Church with the help of many volunteers, long hours by the music and leadership teams, and a sunny day courtesy of Mother Nature. 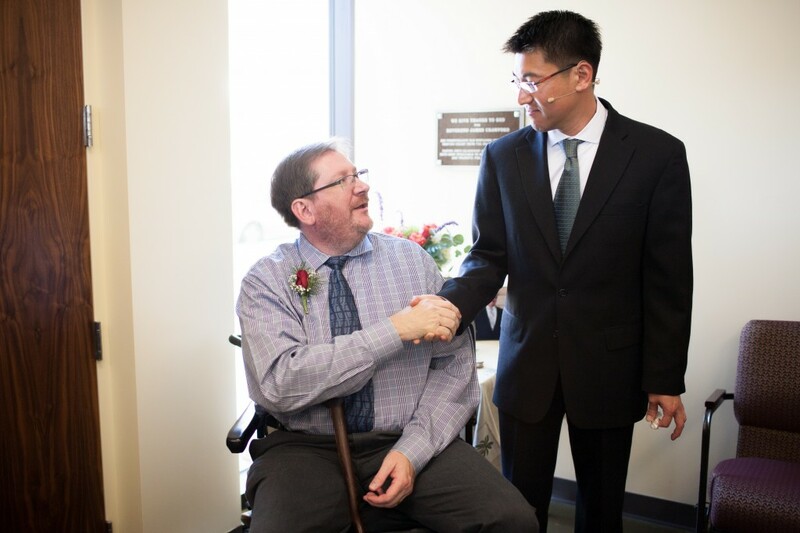 Here are a few pictures of people who rejoiced with us and shared this special day in our new facilities. 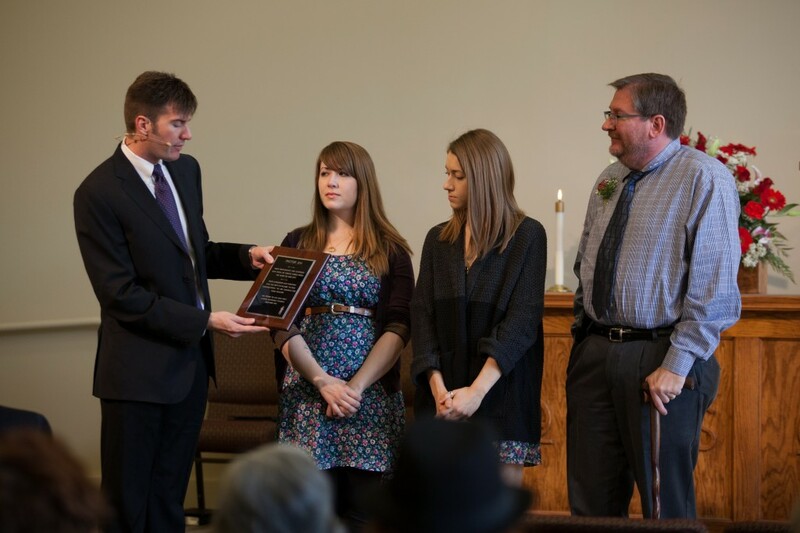 New displays provided history lessons and support for worship leadership team. 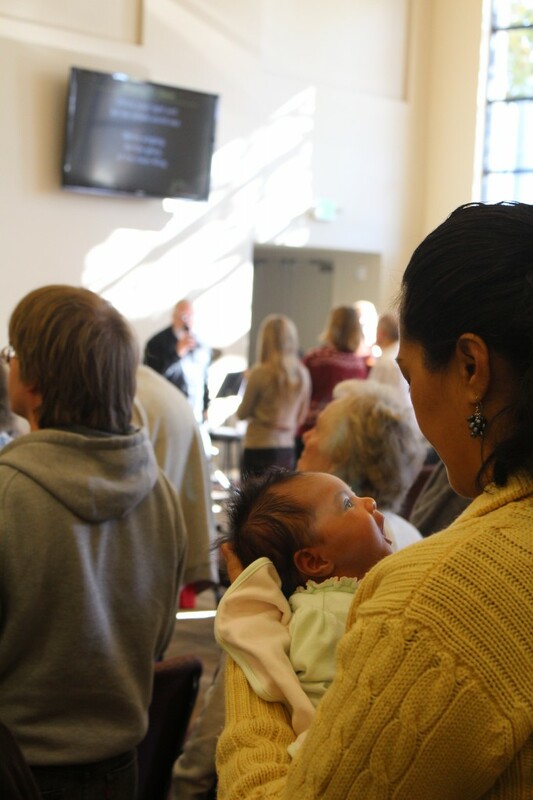 The youngest singer joining us today was just one month old. 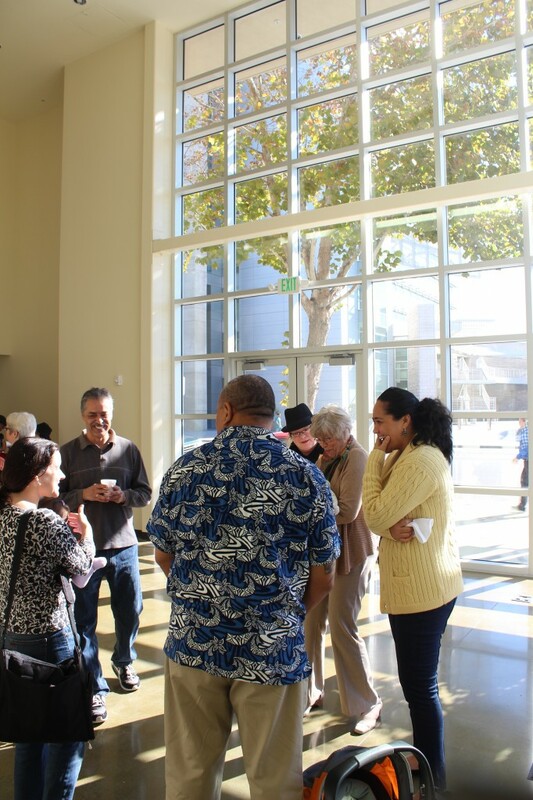 After Church we celebrated and shared fellowship in the Atrium. 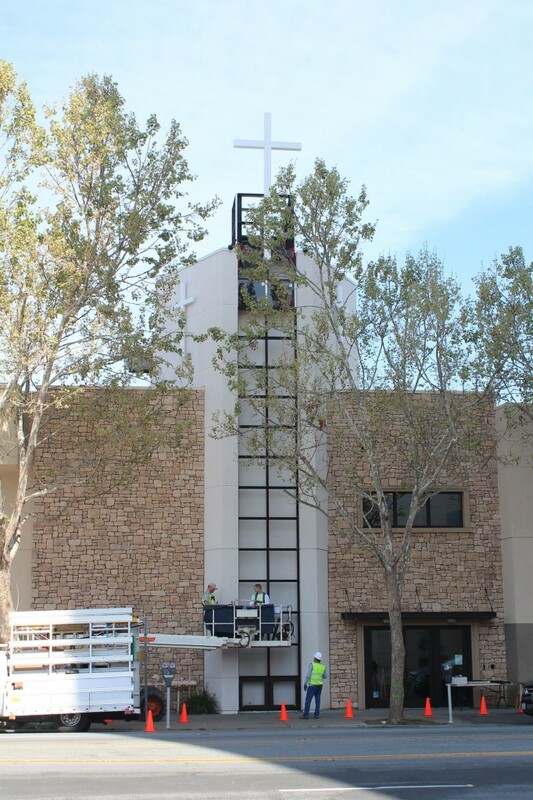 Here are a few outside views of the new Church taken this morning.